If you follow @LeeFromAmerica on Instagram (and if you don’t, you should), you’ll know that she is a wellness guru who is all about living with intention. Inspired by Instagram’s viral trend of intention sharing, we couldn’t think of a better way to kick-off the new year than to partner with Lee on a limited-edition bottle. 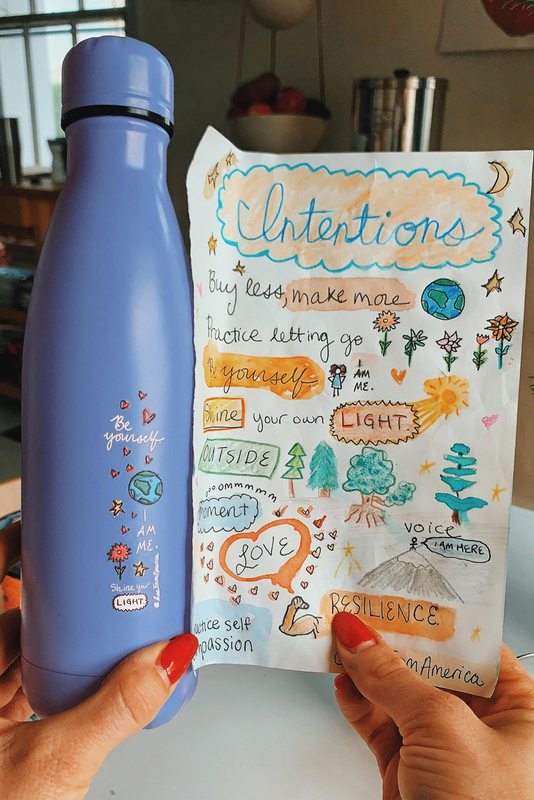 Featuring Lee’s signature illustrations, our exclusive Intentions bottle will serve as a helpful reminder to be more mindful, sustainable, and true to yourself in 2019. 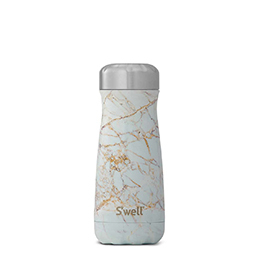 Grab one and share your intentions with #SwellxLFA! What are you looking forward to most about 2019? What are your intentions for the new year? In 2019, I am looking forward to growing up and into myself. It may seem odd, as I am already considered an adult by society’s standards, but in 2019, I look forward to getting to know myself even more deeply: becoming more independent from the past, becoming prouder of who I am, releasing shame, accepting myself and all my quirks, and just hanging out with myself. How are you planning to go green in 2019? What are a few easy ways for all of us to lead more sustainable lives? Sustainability is a big word, and it can get pretty overwhelming when we start to look at the numbers and data and our own lives. My favorite ways to go green are to start small. You don’t have to sell your belongings, give up your car and job, and move to the woods—that is, unless you want to! There are smaller things, everyday things, that can help make the world a greener place, so to speak. My favorite things to do to becoming greener are below. ● Cut down on your meat consumption and up your vegetables. 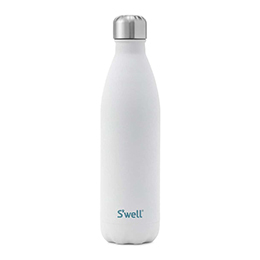 ● Think ahead: bring a S’well water bottle to work or errands with you in case you get thirsty. ● Eat more meals at home. ● Get your books from the library. ● Air dry your laundry. ● Repurpose mugs as plant holders. ● Skip the plastic produce bags at the grocery store and scrub your produce at home. ● Say no thank you to disposable coffee cups. ● Forego a straw if you are able. ● Carpool or use Lyft Line. ● Use a handkerchief as a napkin, tissue, or small bag to carry nuts/pastries in. ● Buy plants for your house. It makes everything more peaceful. ● Use old grocery paper bags as gift wrap. ● Use mason jars to store all your nuts and seeds in. You seem to effortlessly embrace both the fashionable and the eco-friendly. How do these things inform each other? I believe the two coincide. While I am certainly not 100% eco-friendly when it comes to my wardrobe, I do my best to buy and sell clothes on apps like Depop or Poshmark. I have a staple wardrobe of neutrals, crewnecks, and soft tees that I always fall back on. I love wearing vintage jeans, sweatshirts, and tees. They are already soft and worn-in, what could be better? In 2018 I made an effort to reduce my spending at fast fashion stores. After reading some of the effects these brands had on our planet, I got disturbed. I looked at my life and to see if I could make any changes. I am in a position where I can spend a bit more money on quality products that last longer, so I do that when I can. I recognize this is a privilege and not everybody can do that though. It’s a tricky line—many of the eco-friendly or locally made brands are much more expensive than their fast-fashion cousins. It’s a catch-22. Tell us about your wellness routines. What are three things you do every day that make you feel great? My morning routine is sacred, though I just got a puppy so it’s totally thrown it for a loop. In general, I like to get up before the sun, meditate for 10 minutes, have hot tea, then move my body by either hiking, doing yoga, going for a walk or a jog. Then I come home and caffeinate, shower, self-oil, then get settled into my work day. I like to cap off the day with a warm bath, a good book, cuddles with my pup, ice cream or a massage. I also consider home cooked meals a very vital part of my wellness routine. My body feels best when it’s eating foods I cooked for it. 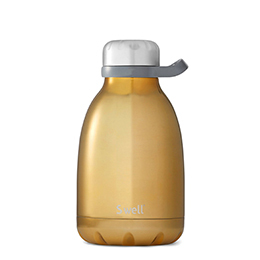 What S’well products do you use most often, and when/where/how do you use them? My staple bottle is the classic 25oz Bottle. I use it for yoga, walks, errands, and even to water my plants. It fits in my cup holder in my car and it’s easy to chuck into my bag for the day. I have them in so many different colors. I love them. 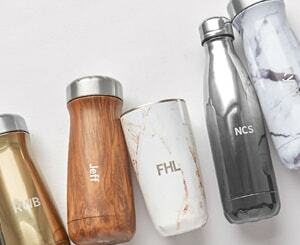 The 20oz Traveler is a personal favorite for traveling. I love to bring my matcha lattes in here and throw it in my bag and not have to worry about spillage. The Roamer is AMAZING for camping, long trips, road trips, and even plane rides. I also bring it to hot yoga with me. I once filled it with ginger tea and brought it on an overnight trip with me and it lasted all night!